The Golden League is the League of the Wine Champions. The one to win this highlight of the DWM competition undoubtedly ranks among the world’s most successful wine producers. For you, this means: as a Golden League winner, you hold the unofficial world cup of the wine industry in your hands. 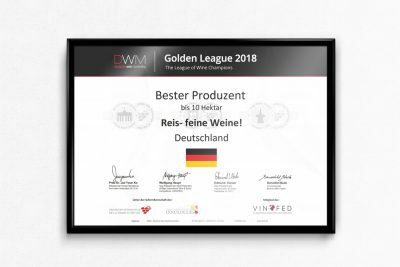 In the highly remunerated Golden League, the winners of all DWM Wine Trophies from a calendar year enter compete against each other seeking for the best of the best. Instead of another tasting competition, a medal table is prepared (like at the Olympic Games) – the overall medal table of all DWM Wine Trophies. Here, all Silver, Gold, and Grand Gold medals of all DWM Wine Trophies of a calendar year are tallied for each entrant. The one to achieve the most medals at Berlin Wine Trophy, Portugal Wine Trophy and Asia Wine Trophy wins the league of the top producers. 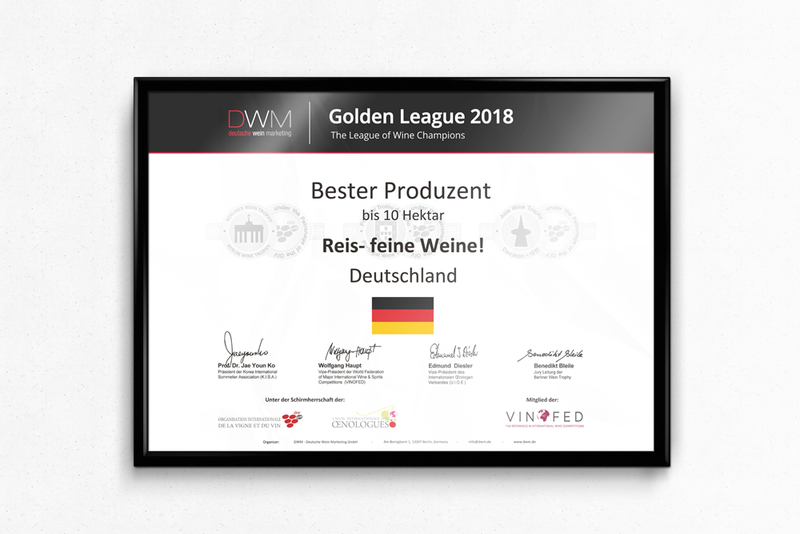 With the Golden League, DWM introduced in 2014 an additional award for the submitters of the various Wine Trophies, which is only reserved to the producers. In order to offer opportunities to the smaller producers to position themselves in addition to the big players based on their quality, different categories have been introduced here that were formed on the basis of the company size. Companies that buy additional quantities of wine or grapes and market them under their own label are classified according to the total amount produced. This leads to an objective comparison other companies of its size. • There will be a category each for producers with sizes up to 10, up to 20, up to 30, up to 40, up to 50, up to 100, up to 250, up to 500 and over 500 hectars. • There will also be a category for cooperatives up to 250, up to 500 and over 500 hectars. • For sparkling wine producers, there will be a category each for up to 25, up to 50 and over 50 hectars. • Generally for fortified wine producers (Port wine, Madeira, Sherry, etc.). The division into these categories is the best way to ensure an objective classification. All the products awarded at the Wine Trophies will be considered in the reviews. For the different medals, a score has been set. The addition of the individual scores and individual Trophies contributes to the total score for each company at the end of the year. Special feature of silver medals is that in this review, all products will be considered in addition to the officially awarded silver medals (always marked with Category IV in our system), which have received the required number of points for a silver medal, but could not receive a medal due to the OIV rule (only 30% may be awarded). On the website of DWM, each winner from a particular category will have the opportunity of a presentation in a separate area.